Bishop Marcello Semeraro, coordinator of the Council of Cardinals, should be the man who will communicate today to the chiefs of Vatican dicasteries the decisions the Council has made for Curia reform. At the presence of Pope Francis, following a schedule that has much of definitive and little to discuss, the chief of dicasteries have been convoked at the eve of the sixth meeting of the Council, which will take place Dec. 9-11. There will be no discussion, just a communication of decisions. This according to many sources, that mostly collect rumors. In fact, some appointments had not come according to the time they had been rumored, which let think to a change of mind or a change of scenario. Time for reform has come, but it is very difficult to outline how this will be shaped. According to rumors, the establishment of two new congregations will be the most important novelty of the Francis’ Curia. First possible news: the Pontifical Council for Justice and peace will be elevated to the rank of Congregation. Under it, five secretariats: for Life and Human Ecology; for Justice and Peace in the World; for Migrants; for Health Care; and for Charity. This implies the downgrading to mere secretariat within a congregation of (respectively) the Pontifical Academy for Life, the Pontifical Council for Migrants, the Pontifical Council for the Pastoral Health Care, and the Pontifical Council Cor Unum. This latter had a special role in delivering the Pope’s charity in the world – a specialty that the current president, Cardinal Robert Sarah, underscored to Pope Francis when he met him for a private audience last week. Cardinal Sarah is reportedly due to be appointed Prefect of the Congregation for Divine Worship and Sacraments; if the appointment will be announced, as it seems, he will be called to take over to manage a difficult situation after the sudden departure of two long-term officials like Anthony Ward and Miguel Anguel Ferrer and the appointment of a single undersecretary in the person of Msgr. Corrado Maggioni. Perhaps, Sarah is being made to pay the fact that he had been in charge of Cor Unum during a difficult transition for Caritas Internationalis under the guidance of Cardinal Oscar Andrés Rodriguez Maradiaga . It may seem odd, but it is not, since Cardinal Maradiaga is the person that should take over the post of prefect of the other new Congregation the Council of Cardinals may announce today: the Congregation for the Laity and the Family, which will embody the Pontifical Council for the Laity and the Family. If Cardinal Maradiaga is indeed appointed to lead the Congregation, he would arrive in Rome with a new opportunity for a fresh start. In 2012, Caritas Internationalis was amid a storm: the Holy See did not give the ‘nihil obstat’ to the re-candidacy of Lesley Ann Knight as Secretary General. Knight, who was at the time holding the post, had been severely criticized because the Canadian Catholic Organization for Development and Peace had been put under the Caritas Umbrella. Development and Peace had in fact supported associations who advocated the legalization of abortion. Moreover, Caritas Internationalis was also a member of the World Social Forum, and obviously not all the groups under the World Social Forum umbrella share Catholic principles. Because of the storm, Lesley Ann Knight lost the post, while Maradiaga was kept as president and Michel Roy appointed Secretary General. What happened with Caritas Internationalis brought about the start of the big reform of Vatican charity, that had started with the new Caritas Internationalis statutes and in the end involved all the Church’s charities. Cor Unum was among the main players of the transition, since it is so prominent in this area. On the other hand, Cardinal Maradiaga was sided until Pope Francis’ election: the Honduran Cardinal had never gotten rid of the charge that he had at least been an accomplice of Caritas’ dangerous liaisons with Catholic organizations fickle on Church Doctrine. These are things whispered in Vatican corridors. But every whisper has a weight, in the Vatican. Maradiaga had climbed Pope Francis’ heart. The World Meeting of Popular Movements – which in fact included many labels of the World Social Forum – organized by the Pontifical Council for Justice and Peace and held at the Vatican elevated Maradiaga’s importance, especially after the Pope delivered to its members a speech – an encouragement to carry on the fight, and the promise that their protests will be part of the new encyclical on ecology the Pope would write. Healed from the Social Forum injury, Maradiaga can get back to Rome and take that post he coveted so much, working as Pope Francis’ right hand. Since the beginning of the Pontificate, Maradiaga has wanted to be considered one of Pope Francis’ most influential advisers. Cardinal Peter Turkson should become the prefect of the Congregation for Justice and Peace – as his term as president of the Pontifical Council is expiring. The reform will also lead to the retirement of Cardinals Vegliò and Rylko, respectively presidents of the pontifical councils for Migrants and for the Laity, who should be given the posts of Member of the Congregation. The archbishop Vincenzo Paglia, president of the Pontifical Council for the Family, could be given the post of Canonical in Saint Mary the Major Basilica. That is, a second class post, almost a punishment for leading the diocese of Terni to bankruptcy. However, that of Canonical is a role where Paglia can hopefully apply some lessons learned from his earlier management experiences. This is how the Pope Francis’ Curia is starting to shape up. The dismantling of the old Secretary of State started when the ‘Foreign Minister’ Mamberti was appointed prefect of the Signatura. Now, it should be the turn of the deputy, Archbishop Angelo Becciu, who is rumored may be appointed archbishop of Palermo, thus eventually also becoming a cardinal, or be appointed nuncio to Italy. 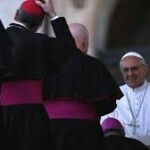 The Pope, however, does not want that any given post be associated with a red hat – he prefers to give the birretta rossa to bishops he feels closer in tought to him and to bishops of peripheries. On the other hand, it is true that the next consistory could be full of surprises. There are many cardinals that will turn 80 this year: in February, Pope Francis should have a college of electors of 110 people, which will decrease to 105 by the end of the year. The maximum limit of electors cardinals has been fixed at 120. A new round of appointments is expected, and this round will drastically change the geography – and the impact – of those wearing the purple hat. 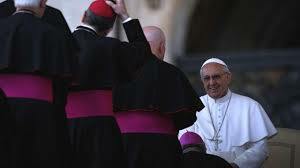 In creating new Cardinals, the Pope will also weigh the ideas of the candidates, in view of the next Synod of Bishops. At the beginning of last week, the General Secretariat of the Synod of Bishops gathered – Pope Francis was present, as is his custom – and underscored the importance of this unprecedented path in the history of the Church. On the basis of the ‘Relatio Synodi’ (Synod’s final report), members of the Secretariat have begun to work on the lineamenta of next year’s synod, and many are looking for a vindication. In fact, the progressive push – which had also watered down the real issues raised during the synod’s debate – had been rejected by the assembly, and brought back to light only by Pope Francis’ decision to publish the vote on each paragraph of the relatio. This decision, together with the Pope’s speech at the Synod’s final Mass, has reignited the enthusiasm of those seeking for a change of pace not only in pastoral activity, but also in doctrine, convinced that only this change of pace will keep the Church up to date. How much Pope Francis will sustain this progressive push may be deduced from the appointment of the new Cardinals, that will be the prelude to the Pope’s picks for the 2015 synod. It is also rumored that one of the new cardinals will be Father Enzo Bianchi, superior of the Monastery of Bose and famous for his ecumenical work – also criticized since he tends to put the truth aside on the name of fostering dialogue. Father Bianchi is a thinker the secular world much appreciates. As is Archbishop Bruno Forte, the drafter of the controversial paragraph on homosexuals in the Synod’s mid term relation. Archbishop Forte could be transferred, perhaps to the diocese of Bologna, where by custom a cardinal presides. Also Archbishop Victor Fernandez is in good terms with secular media: the rector of the Catholic University of Buenos Aires and Pope Francis’ ghostwriter, Archibshop Fernandez is expected in Rome to take over a post as head of a congregation. What is being experienced is, however, a sort of vindication of peripheries with respect to the central authority of Rome, which – according to them – has often suffucated their pushes and forbid them from growing . But Rome is mother, not only leader. And, in the midst of the debate, it is almost a given that a mother would try to prevent her children to lose the deep sense of things, and to put the important values at the center again. But nowadays, peripheries want to be the new center. Curia Reform should give them a higher profile. Recently, the Council of Cardinals sent a letter to all the Vatican dicasteries, asking which of their functions could local bishops’ conferences take over. The problem does not involve pontifical councils, since the bishops’ conferences have already established commissions on their subject matters. The real goal was that of delegating even more of the Congregations’ functions. For example, to give more power of decision to bishops when a doctrinal dispute arises, without going through the Congregation for the Doctrine of the Faith; to give more power to bishops to recognize universities and activities of Charity as Catholic, without undergoing a procedure in the Congregation for Catholic Education and Cor Unum; and finally to give more power to bishops to choose those who may have enter the seminary. Perhaps the most intense criticism received by Benedict XVI was because of this last issue – a hotspot. Among the first decisions made by Benedict XVI, there was an instruction on the access to seminaries, according to which gay and anyone sympathetic with the gender ideology could not become a priest. It was a groundbreaking decision, according to Father Dariusz Oko, a Polish priest who had studied on scientific basis the problem of homoheresy.